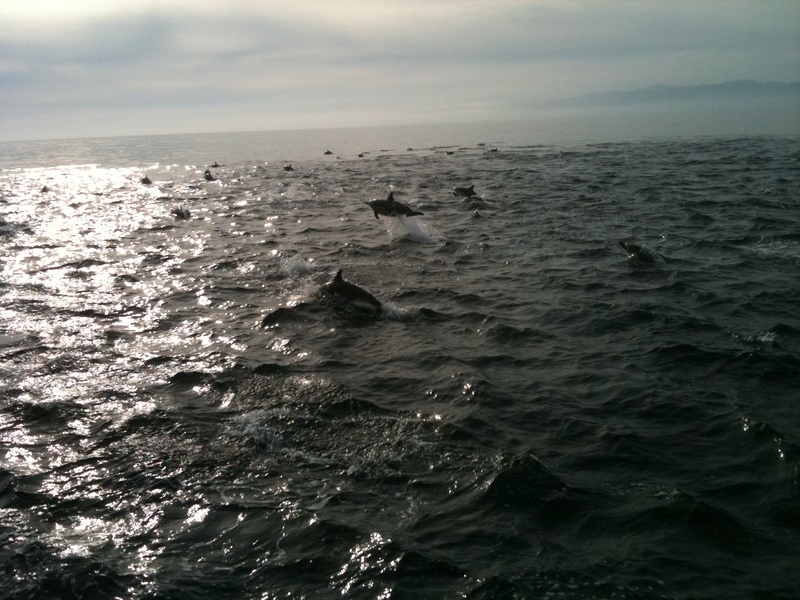 The second large group of dolphins heads east as we near Catalina Island. Last Sunday I was aboard the dive boat Mr. C, headed out to Catalina Island to complete weekend two of the Open Water course I was teaching. Finally, unlike the previous couple of weekends, we had perfectly calm seas, though the skies were overcast with rain possible in the afternoon. Not long after exiting the harbor we ran across a rare, and amazing sight. Dolphins. This was not the usual 4-5 cruisers surfing along the surge of water pushed ahead of the bow of the boat. No, ahead of us were hundreds of dolphins that seemed to be making a beeline across the vast seas for some unknown purpose. They were all cruising at a decent speed, popping up out of the water before sliding back in and popping out again. Our boat was traveling just a little faster than they were and we caught up to them, then slowly moved through the crowd. It was incredible to watch the pod of dolphins all moving along as a giant unit. With no camera on hand, I grabbed my iphone to snag a couple of pictures and a short video. This was definitely not something I had ever seen before, and to top it off we ran across another large pod doing the same thing in the opposite direction as we neared Catalina later in the morning. It was fantastic! Classic Square Knot. An oldie and a goodie, easy to tie, best used for securing two lines together. 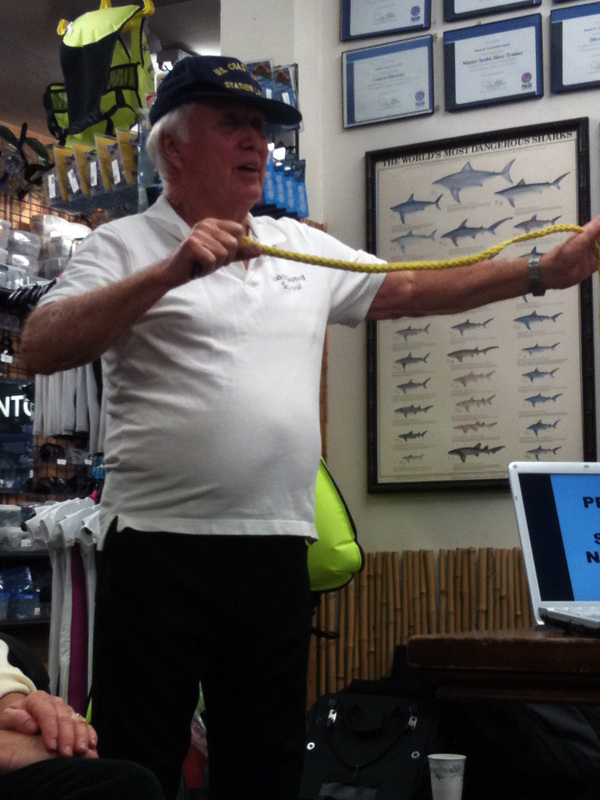 Last night I took part in a knot tying class that was being offered by Eco Dive Center. The class was taught by a retired Navy Admiral from the US Coast Guard school. While I knew most of the knots he covered, the gentleman himself made the class entertaining and fun. He started off by reviewing parts of a line, such as the dead end, or the end that is tied off to something, the bitter end…a loose untied end (think how bitter it would be if you toss your anchor over the edge and didn’t secure the “bitter end”!). If you put a loop in the middle of a line, thats known as a bight or bite in the line. From there, in his casual and often “old man” meandering fashion we moved into tying several different knots. I wouldn’t say it was really an “advanced” knot tying class, he reviewed mostly the basic knots that are useful in any ocean related activity, such as diving, sailing, etc. We started with simple overhand knots, then expounded that into the figure 8 knot, one I was familiar with from rock climbing. Both those knots are useful as quick and simple ways to tie a looped end that can be secured around anything. You can also use a longer line with several looped “bites” to create a quick makeshift ladder out of a single line. A figure 8 knot tied into the bight of the line. I learned that the "bight" is the looped end. Moving on from there he went into more knots such as the square knot, one that I’ve used many times, though often I just think of it as the “over – under” knot since its quickly tied correctly by remembering that you place the right end over the left, then the left over the right. Otherwise you can end up with a granny knot that will start to slip once tension is applied. We reviewed the sheet bend, another knot primarily used for tying two lines together. 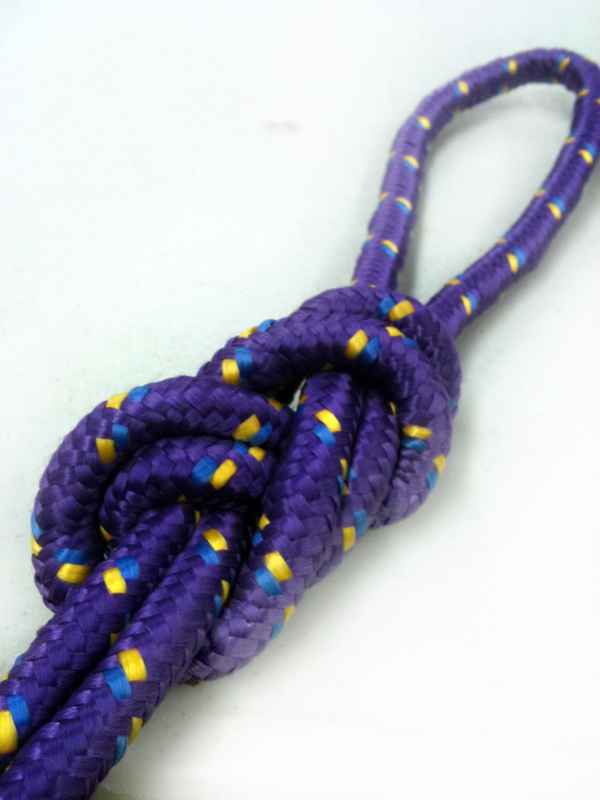 Its stronger than the square knot, and you can modify it by adding in additional loops which adds even more strength. When it came to the bowline, the real fun began. 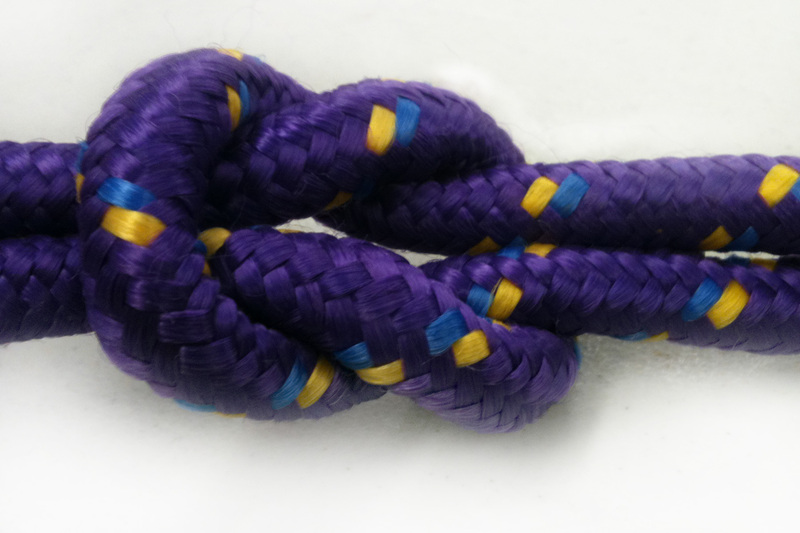 This is a knot that is often used in diving for rigging lift bags, or tying off to different objects. 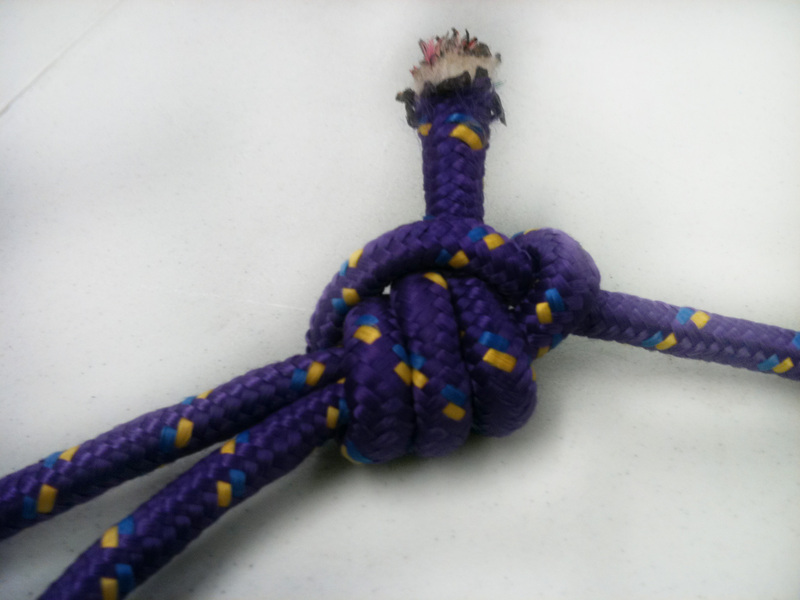 Our instructor attempted to teach us a way to tie this knot one handed, which is quite complicated, and led to much amusement as everyone worked at it. He also wowed everyone by swinging the rope around a few times then pulling it taught revealing a perfect bowline, then garnered laughter by teaching us the very difficult knot, a “Dragon Bowline” (or so I thought he said). Turns out it’s a play on words as he set his bowline on the ground and pulled it along…get it? A dragging bowline! The night ended with adrenaline rushing as we all competed to be the first to tie which ever knot he called out to the group. I’ll admit I held my own, coming in first on several knots and earning myself a nice Eco Dive ball cap (which is good, because I didn’t have one yet! ).